It affirms his full divinity, for he shines with the same glory that overshadowed Sinai. It affirms his human nature, for the Logos who now shines with divine glory is also the man Jesus Christ who had to walk to the top of Mount Tabor. It affirms the communion of saints, for Moses and Elijah from heaven appear together with the disciples on earth. It affirms the capacity of matter to bear and manifest divine glory, for Christ’s garments as well as his body shine with this divine light. With these rich associations it was with joy that I accepted the commission from Father Philip Conner to paint the Transfiguration on the east wall of his chaplaincy centre at Lancaster University, U.K. It was to be a large fresco – 10.4 metres wide by 4.8 high (34 x 16 feet) to be precise. This was exciting, but the design was going to be a challenge because the scene had to be landscape rather than portrait orientation. Virtually all icons of the transfiguration are in portrait format, with Christ, Moses and Elijah above and the three disciples below. This wasn’t possible here. But such limitations open doors, compelling one to create work you wouldn’t otherwise think of designing. Fr Philip also wanted the wall painting to make worshippers feel that they were part of the event, and indeed to relate it to the whole locality of Lancaster. My solution was to lower the figures towards the edges so they were not towering over the congregation. James kneels on the left, with Peter half kneeling next to him. John half kneels on the right, and the low tree at the far right balances the composition. Plants and birds from Lancaster are included below: on the left is the hen harrier, and to the right is the splendid curlew. These particularities show that this event, while happening in chronos or created time two thousand years ago, spills out into kairos or divine time and affects all epochs and places. In fact everything about the way icons are painted manifests the world in its transfigured state. Icons suggest a world that is aflame with the Lord’s power and love, like Moses’ bush that burnt without being consumed. As the writer to the Hebrews says, Christ “upholds all things by the word of his power” (1:3). Icons do not use chiaroscuro or a single external light source, for the light of Christ shines from within everything and surrounds everything. The Greek word for the created world is cosmos, which also means adornment. So when the Scriptures tell us that Christ’s garments – his ‘adornment’ – shone with light, we can also read this as the whole material world shining with light through participation in Christ. Union with God does not obliterate each person’s uniqueness. In fact it purifies it and brightens it. The green of a clear emerald is brighter than an opaque emerald because it transmits more light. So in our fresco each of the disciples reacts in a different way, wears different clothes, has a distinct face. In the thinking of the Orthodox Church, icons such as this one do not only help people pray, but are themselves prayer in paint. When my assistants and I painted this we were praying not with spoken words but with colour. This is one reason why I like to use natural materials. This work was painted with pigments and stones from the earth, bound together with casein, a natural glue derived from milk. This act of prayer with matter is itself a transfiguration of matter. The stones are crying out the Lord’s praises. Aidan Hart: The Transfiguration Wall Painting at Lancaster Catholic Chaplaincy, UK. 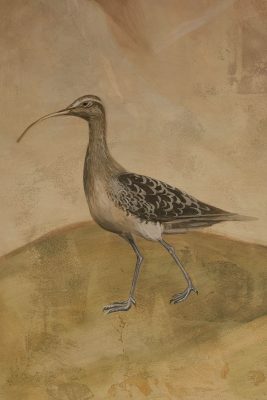 Detail 1: St. John; detail 2: Curlew. 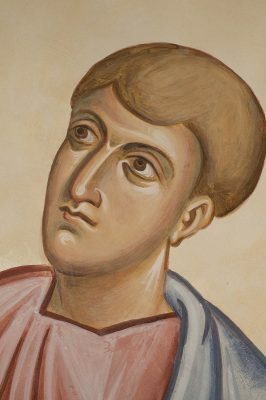 * Aidan Hart: Techniques of Icon and Wall Painting, Egg Tempera, Fresco, Secco, Gracewing Publishers, 2011. This is the most comprehensive book to date on the techniques of icon and wall painting. Illustrated by over 450 colour illustrations and over 160 drawings, it is a source of pleasure and inspiration for the general reader as well as for the practising icon painter. More than just a technical manual, it sets artistic practice in the context of the Church's spirituality and liturgy, with chapters on the theology and history of the icon, and the reasons behind the placement of wall paintings within churches. ISBN 9780852442159. $74.00. *Aidan Hart: Beauty, Spirit, Matter, Gracewing Publishers, 2014. A collection of essays on contemporary issues as seen through the theology of the icon, covering subjects such as ecology, the role of the material world in the spiritual life, beauty, the revival of liturgical art, the nature of the human person, and abstract art. 256pp + 32pp colour plates. ISBN 9780852447826. £14.99.